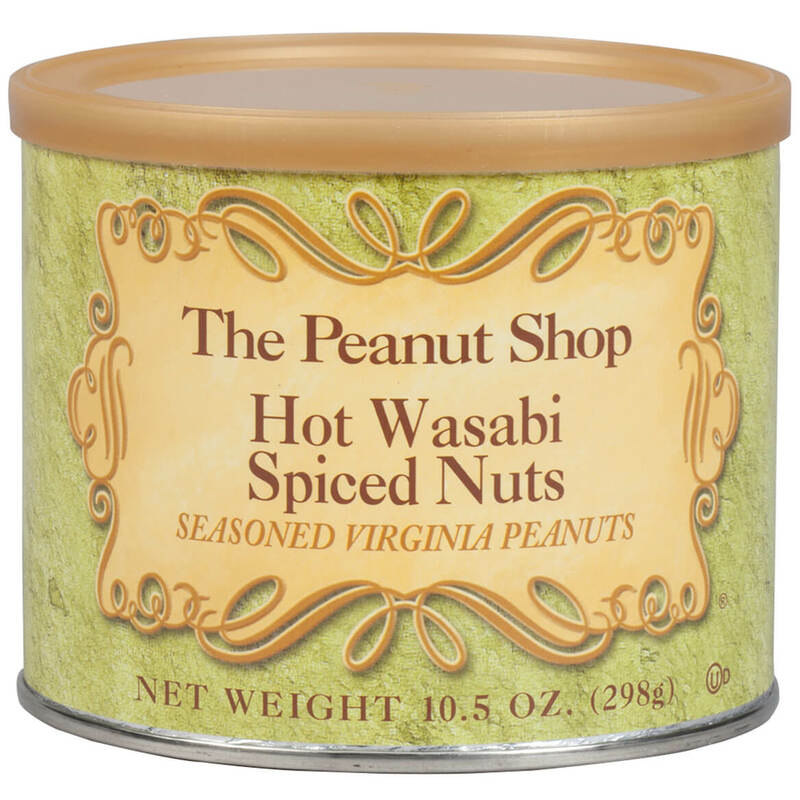 These extra-large “cream of the crop” The Peanut Shop® Hot Wasabi Spiced Nuts are handcooked in small batches, seasoned with the intense flavor of Japanese horseradish and sure to wake up your tastebuds … as well as your sinuses! Delightfully turning up the heat, yet allowing the great peanut flavor through, they’re a cocktail party conversation starter you’ll be proud to share. Incredibly addictive and deliciously healthy, Hot Wasabi Peanuts are made in the USA by a Virginia peanut company, supporting American farmers. 10.5 oz. 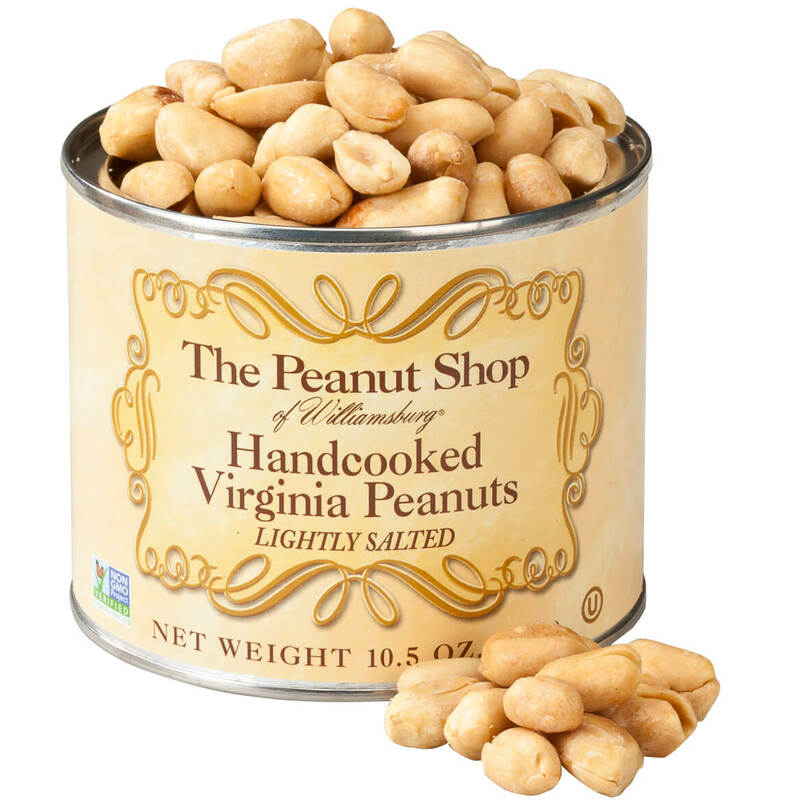 These aren’t ordinary salted peanuts … they’re plump, meaty, hand-cooked Virginia peanuts with a big reputation and an even bigger crunch! The super-sized, cream-of-the-crop gourmet peanuts are lovingly hand-cooked in golden peanut oil with no additives or preservatives to alter their natural goodness—and you’ll taste the flavorful difference. Loaded with protein, vitamins, fiber and other health perks, they’re gluten-free, Kosher certified, lightly salted and the ultimate gift for any peanut lover! 10.5 oz. This bright holiday snack tin is packed with all your favorite goodies—giant freshly roasted peanuts, plump juicy raisins, crunchy candied peanuts and sweet milk chocolate gems. 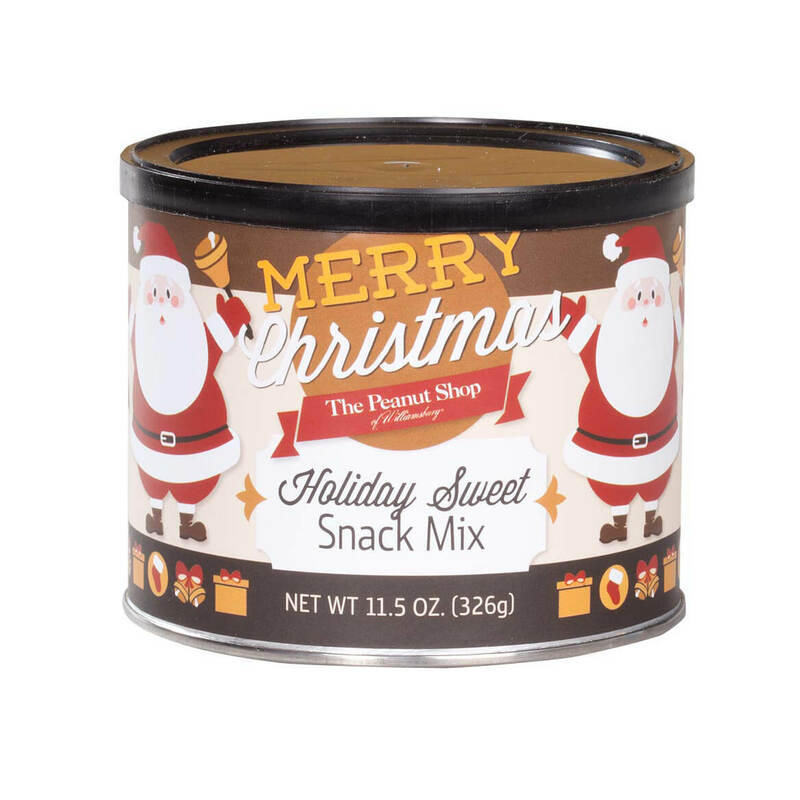 The Peanut Shop® Merry Christmas Holiday Sweet Snack Mix is packed at the peak of freshness, promising merry munching for you … and sweet satisfaction for savvy snackers on your Christmas list! 11.5 oz. 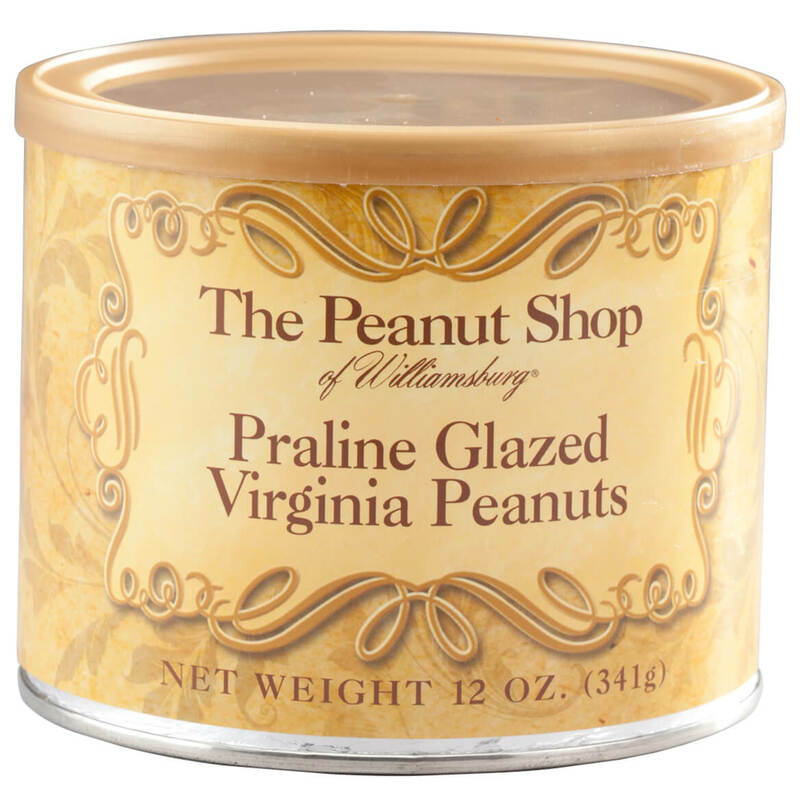 The Peanut Shop® uses super-sized, cream-of-the-crop Virginia Peanuts for these praline glazed beauties … and old-fashioned handcooking creates pure magic. Delivering sweet-and-salty perfection in every giant, crunchy gourmet peanut, you’ll taste the difference, handful after heavenly handful! Wonderfully addictive and gluten-free, The Peanut Shop® Praline Glazed Peanuts are proudly made in the USA, deliciously supporting American farmers and thrilling your tastebuds! 12 oz. These savory, superstar The Peanut Shop® Salt & Vinegar Peanuts are smothered with the tangy spiciness of salt and vinegar—and it’s easy to taste why they disappear fast! Boasting a legacy of Southern goodness you’ll be proud to serve or give, the extra-large peanuts are the highest grade available, and only the best make the cut for each handcooked batch. Boasting incredible flavor and wholesome health benefits, these flavored peanuts are proudly made in the USA by a Virginia peanut company, supporting American farmers. 10.5 oz. 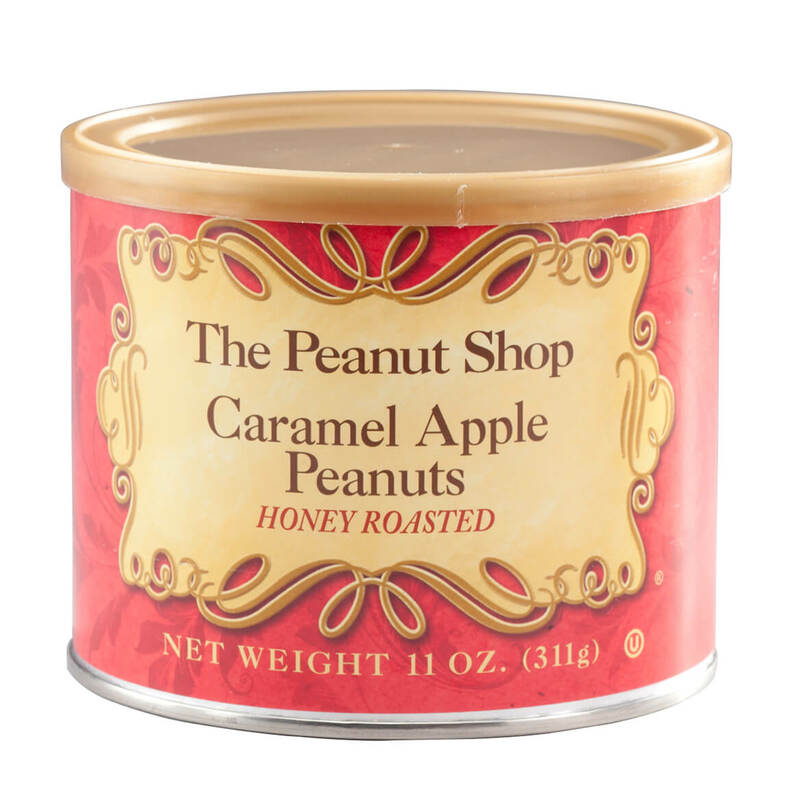 Roasted with pure honey and coated in an apple pie spice blend, The Peanut Shop® Caramel Apple Honey Roasted Peanuts treat your tastebuds to caramel apple pleasure—with the large, legendary crunch of plump Virginia peanuts. Handcooked in small batches for a taste of pure Southern goodness, the sweet, satisfying flavored peanuts disappear like magic, leaving fans happily addicted. Gluten-free and Kosher certified, these honey peanuts are proudly made in the USA by a Virginia peanut company, deliciously supporting American farmers. 11 oz. 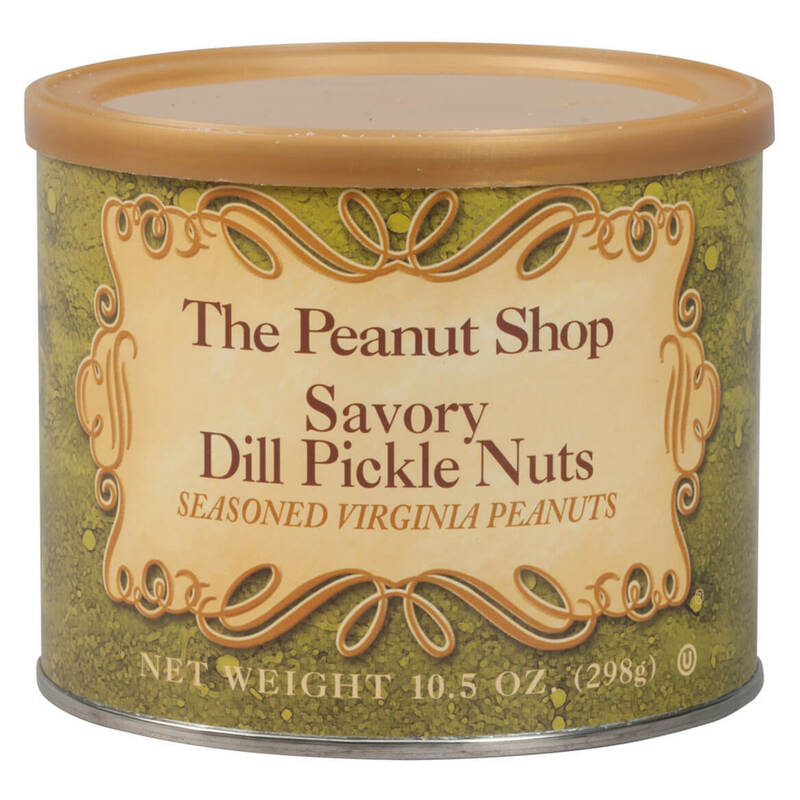 Treating tastebuds to the thrill of dill with the crunch of a plump Virginia peanut, these unique The Peanut Shop® Savory Dill Pickle Nuts are so yummy, even non-peanut eaters are completely addicted! Handcooked in small batches and seasoned with dill for the flavorful “tickle of a pickle”, the extra-large gourmet peanuts disappear like magic once the tin is open. Gluten-free and Kosher certified, Savory Dill Pickle peanuts are proudly made in the USA by a Virginia peanut company, supporting American farmers and delighting your dill pickle cravings! 10.5 oz. 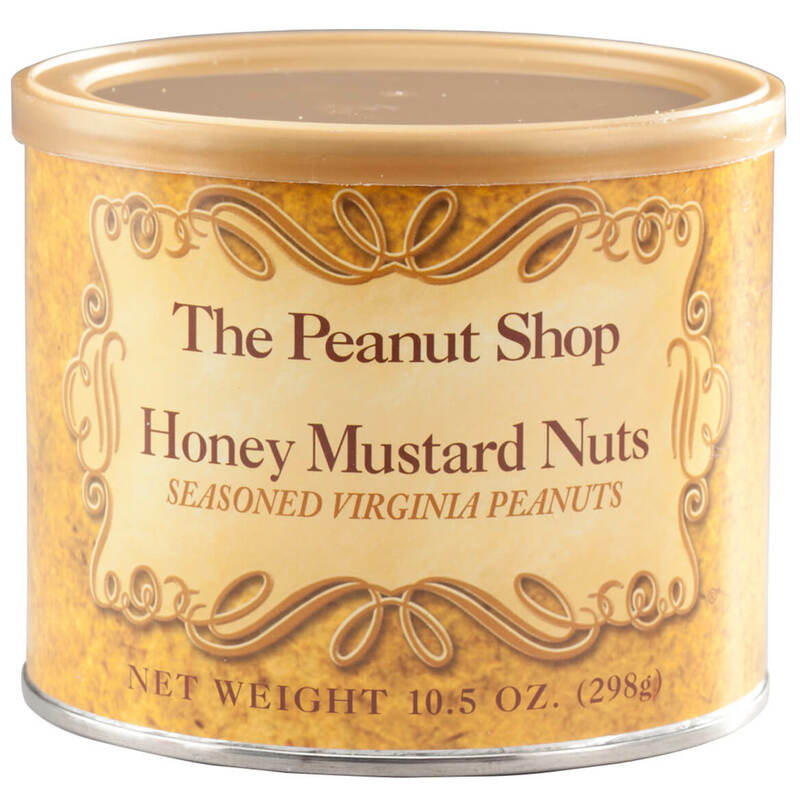 Sweet, sassy and SUPER extra-large … these premiere The Peanut Shop® Honey Mustard Peanuts are handcooked in small batches and smothered with tasty honey mustard seasoning. Delivering pure satisfaction for honey mustard fans, they’re distinctively unique and always great tasting. Crunchy, addictive and wonderfully healthy, these flavored peanuts are made in the USA by a Virginia peanut company, supporting American farmers. 10.5 oz. 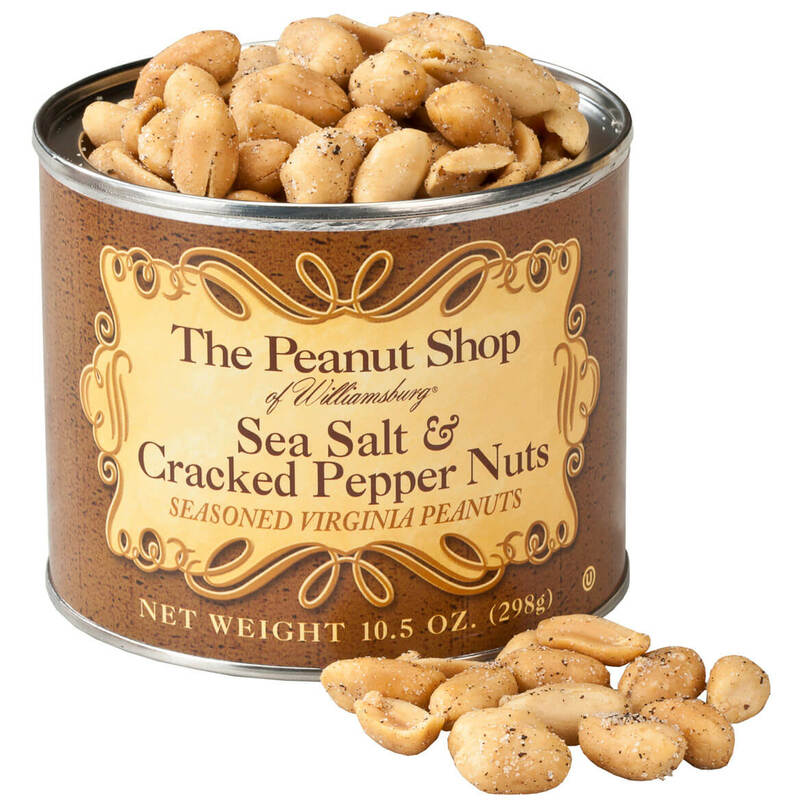 Voted “#1 seasoned peanut favorite” by a Virginia peanut company’s discriminating customers, these magnificent sea salt & cracked pepper nuts live up to all the hoopla! 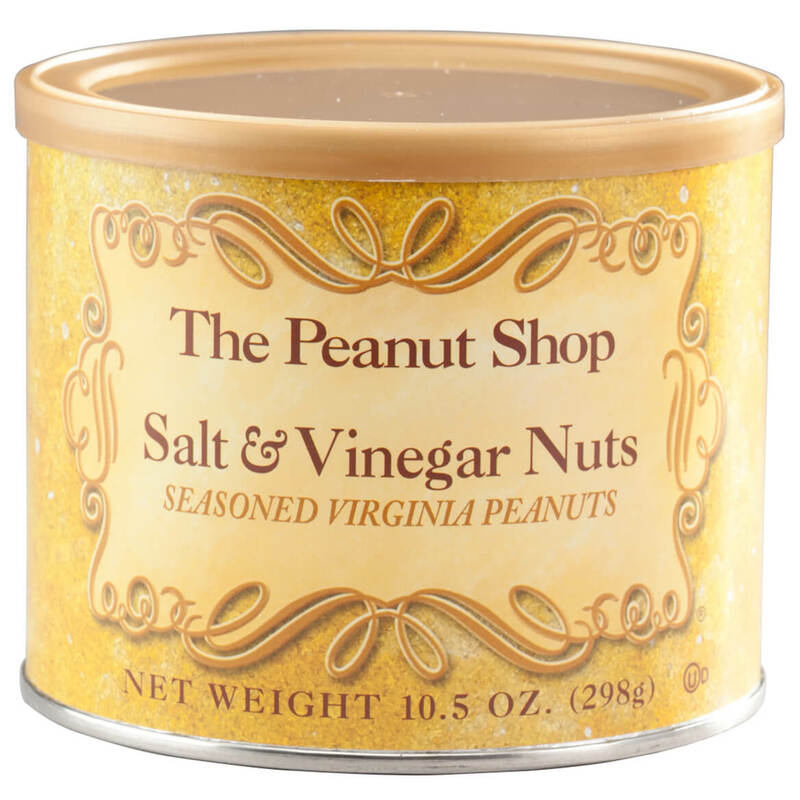 Hand-cooked in small batches and lightly seasoned with natural sea salt and cracked pepper, the “gold standard” Virginia peanuts will spoil you for anything less. Deliciously good for you, these salted peanuts are gluten-free, Kosher certified and absolutely addictive! 10.5 oz. 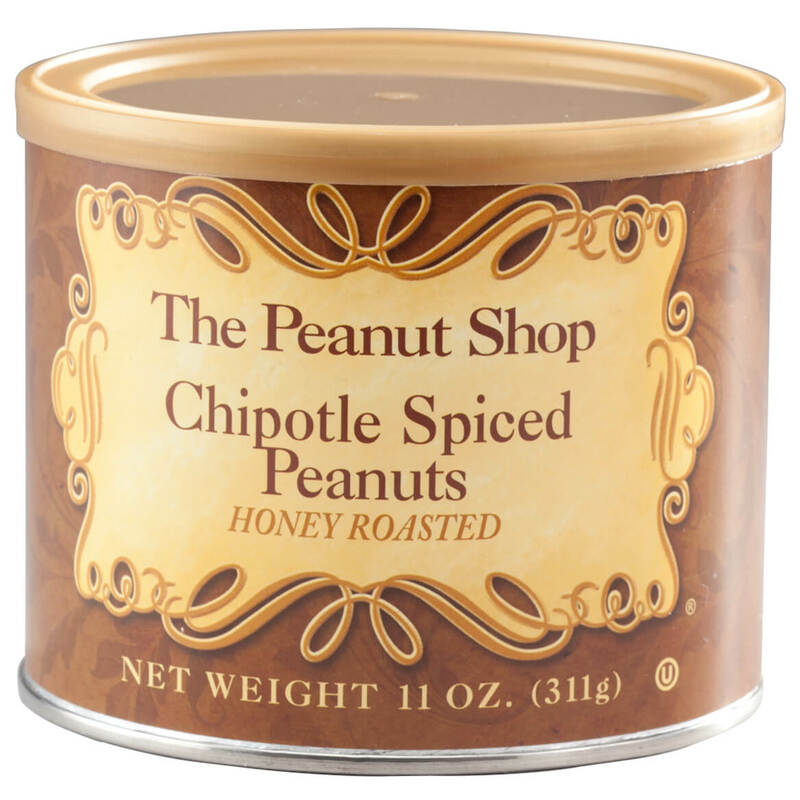 Expertly roasted with pure honey and a smoky chipotle spice blend, these gourmet The Peanut Shop® Honey Roasted Chipotle Spiced Peanuts deliver AMAZING flavor—with the legendary crunch that makes Virginia peanuts second to none! Handcooked in small batches, the plump, premium spicy peanuts boast pure Southern goodness you’ll be proud to serve or give. Incredibly addictive and deliciously healthy, chipotle peanuts are proudly made in the USA by a Virginia peanut company, supporting American farmers and thrilling your tastebuds! 11 oz.